Sorry for the big pics, Master Gildor! Masters Shadyt and Thingol, thank you very much for your words! Master elroi, I am happy too about your joining here. And I like your paintings very much indeed. Have a try, it works, believe me! As others already mentioned, there is a section called : mithril gallery. You find it as a yellow-brown field also on top- nearly . . .
Have a look there and you will find pictures from David, Thingol, Milo and myself. The main "art-section" is under "the art gallery of master samwise" where you already have posted your pictures. You will find a lot of brilliant stuff there. Work on the pics done! And I have took a look to the gallery... your dioramas are excellent (Moria is awesome!!!) and there is a lot of very good and inspiring stuff. I like to make dioramas also... in a near future I probably will make some mithril scenes also, not only miniatures. Please master Elroi, a talented artist like yourself! feel free to send me pics of dioramas in my email that you would like me to display in the "Mithril Gallery" section (not on the forum but the gallery module itself I mean) I think these could be great additions! Looking at your pictures, I wonder if you use metalic paint, it seems not and the result is even better ! 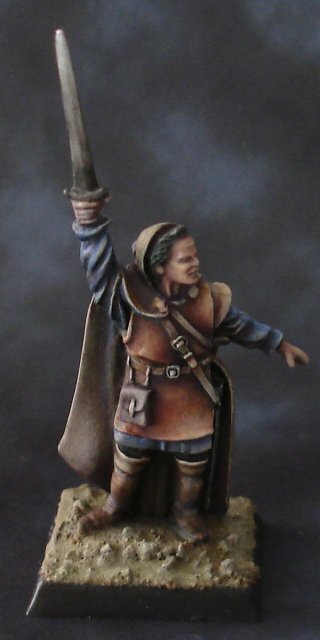 Master Milo, I used metallic paints (Citadel ones), but I use also a lot of washes and thin layers of non metallic ones. I have prepared I little tutorial with some basic steps, I wil post now there. 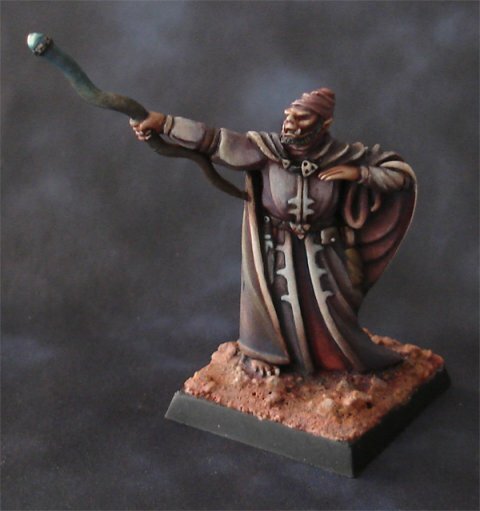 Master Gildor, by now, my only dioramas are GW LOTR, not mithril. If you want pictures of them, just tell me. 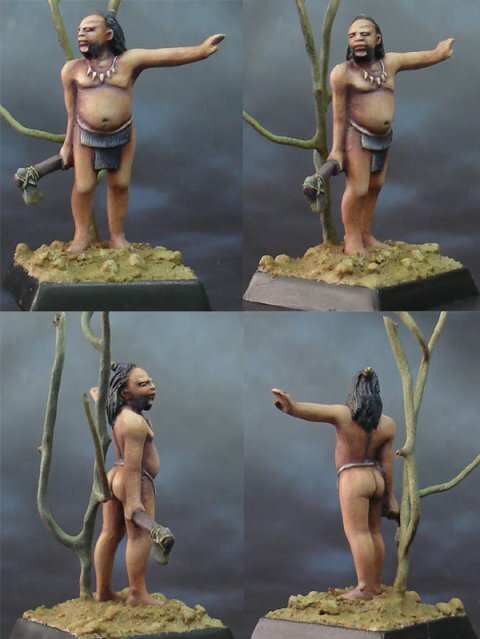 And for the single miniatures, as soon as I paint a decent number of them (10 or so) , I will submit you. Very nice! Love the dragon in the shield, is it NMM? Yes, I will follow Arthadan and milo. A nice colour choice as well and also nice gradients. I still use Humbrol enamels and Model Master colors, and I'm happy with those colors... some of my early painted miniatures are repainted and some of them will be soon. I do not like acrylic and specially not oil paint. Almost same effect you could achieve with mixing mat and satin colors. Could you take a look at my gallery section under Thingol. I prefer to use acrylics better than enamels or oils. With all kind of paints is possible to achieve the same effects and results, but there are big differences between them. But there are not better or worse ones, just different. I use the acrylics mainly because they dry very faster than the others (and this is important for my painting style, because I apply lots and lots of thin layers of paint, for shading and highlighting) and because they use water to dilute (not toxic thinners). I have seen your gallery, very nice compositions, mixing naturalistic scenarios and miniatures. - How much time do you spend painting a single miniature? - Do you have time enough to spend on painting? - Which is your aim when you paint a miniature? Thanks for this answer Master Elroi ! I think you are right in your thoughts and I'm ready to improve my painting style as soon as possible. Especially after I saw here panting works of Master Turambar and in last time - yours. Also I have around 250 repainted miniatures with much more shading, highlighting works and much more tones, not bright colors etc. and I'm going to repaint others in some short future period. And thanks for your offer. In some future period I will send you some pictures of my "work in progress" for advice and comments. I think many of us could do this. Hello Roi and all Mithril Fellowship. Great work here, as usual from you. I always keep my little Mithril collection save as gold in wood boxes, some of them in their original pacage. When you told me about this forum reanimated my interest into paint these little gems. Now I'm preparing a couple of them and I hope to show you it soon. A pleasure to know about people who have your tastes. Elroi, as for you, I fancy woses. I even was one of them 25 years ago when playing MERP ! Your Ghan Buri Ghan is just natural. Perfect skin. Again, I wish to know how to obtain such magnificent body. Which colors are needed ? And finally this Ghan Buri Ghan is remarkable ! But in this case a really good colour shading. Coulering skinn is very ambitious, so I respect this work. And I know what I am speaking about . . .